on the St Vinnie's Soup Van in Footscray. 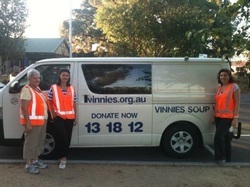 The St Bernard’s College Social Justice Network began in 2012 and have volunteers working on the Footscray St Vinnie’s Soup Van. You don't have to attend meetings to be on the roster. Contact Nikki for more information.